The First Flight Foundation, formerly known as the First Flight Centennial Foundation, continues as a private, non-profit organization whose mission is to Champion the Legacy of the Wright brothers. As the First Flight Centennial Foundation, the Foundation collaborated with the National Park Service to raise funds for capital improvements at Wright Brothers National Memorial. The National Park Service and the State of North Carolina partnered with the Foundation to present “The Event of the Century” in December 2003. The 2003 centennial was fortunate to have the endorsement and support of aviation pioneer Harry Combs, and his gift to the American people of a 1903 Wright Flyer reproduction. Mr. Combs was one of the 100 Aviation Heroes honored on December 16, 2003, during the Celebration. Funds raised through the centennial campaign provided major physical improvements in advance of the December 2003 First Flight Centennial Celebration at Wright Brothers National Memorial. In 1997/98 and 2008 the foundation partnered with the National Park Service for extensive restoration and maintenance of the monument (pylon). Aside from select routine care, the monument had remained relatively untouched since its dedication in 1932. President George H.W. Bush, #41, served as the honorary chair for the 1998 restoration campaign and re-dedication of the monument. President Bush presided over the 1998 monument rededication and served as the feature speaker for the event. The 2008 monument collaboration with the National Park Service included a “facelift” for cleaning the interior and exterior of the monument; repointing the mortar; painting the stairs, rework of the dome and beacon; replacement of the mechanical and electrical systems; and the addition of a new external lighting scheme to enhance the architectural design on the granite. In 2011 the Foundation was joined by many soaring aviation partners for SOARING 100, the international celebration of Orville Wright’s world record 9 Minute 45 second soaring flight over the dunes of Kill Devil Hills. The 1911 glider soaring event introduced to aviation the industry and sport of soaring. Over 10,000 attended the centennial events Oct. 21-24, 2011. The highlight of the celebration was the glider/sailplane soaring flights and landings on the grounds of the Wright Brothers National Memorial just south of the 1903 flight line of the world’s first powered, manned, controlled flight by Orville Wright on Dec. 17th. A feature attraction of the 2011 SOARING 100 was the world’s first reproduction of the 1911 glider by Wright historian Rick Young. In 2012 the Foundation was a patron sponsor for the 2015 Cadet Class of the United States Air Force Academy Exemplar, the Wright Brothers. The Foundation assisted the Exemplar committee with concept, artifacts, vintage clothing, and historical context. The Foundation coordinated the provision of a Wright Brothers’ bicycle chain from the National Park Service Outer Banks Group archives for the exhibit. The Wright Brothers are the only civilians selected as an Exemplar for the academy. On October 15, 2013 the world witnessed a new chapter in the historical and friendly rivalry between North Carolina and Ohio as the birthplace of aviation. The Foundation partnered with the National Aviation Heritage Area for a joint press conference denouncing a claim by Connecticut via a law passed by the CT state legislature that Gustave Whitehead preceded the Wrights in flight. North Carolina Sen. Bill Cook and Ohio Representative Rick Perales led the joint initiative rebuking the CT claim/myth reaffirming the Wrights’ place in history. In March 2014 the Foundation awarded a $150,000 grant to the North Carolina Museum of History foundation. The museum’s foundation used the funds to purchase the 1911 glider and to develop exhibit panels for the Wright 1911 North Carolina chapter. 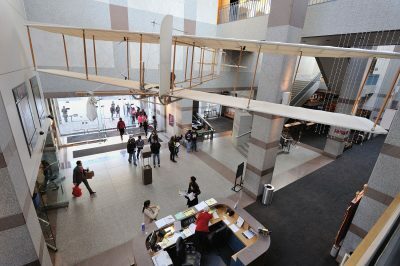 The 1911 glider hangs (soars) in the museum’s atrium main entrance on Edenton St. in Raleigh, NC. The Foundation and the NC Museum of History foundation are in discussions to preserve and tell the complete North Carolina Wright story. Regrettably, public awareness of the Wrights’ is generally limited to the first flight on December 1903. The First Flight ensured the Wrights’ legacy in aviation and world history and put North Carolina, specifically Kill Devil Hills and Kitty Hawk, on the world stage and map. The two foundations desire to tell the entire North Carolina Wright story including 1900-03, 1908, 1911, 1928, 1932, and Orville Wright’s last visit to the Outer Banks in 1945. Also in March 2014 the foundation donated a six panel Soaring 100 exhibit and video to the North Carolina Transportation Museum in Spencer, NC. To fulfill the mission of championing the legacy of the Wright brothers, the foundation has set the following parameters: to protect and preserve the monument; to advocate for the Wrights’ lifelong work and their place in history; to educate the public and increase awareness of the Wrights’ and their work’s impact on aviation, science, engineering, history; and humanity; and to collaborate and partner with other Wright entities to preserve and share their enduring gift of flight to the world.